I need to convert a newly set up MS SQL database on the host server to become the same database as I have been testing on my development server. I'm switching to a new hosting company. How can I publish my database on this new hoster? I need a way to get the structure and the data from my local SQL database into the SQL database hosted by my hosting company. I am able to create a new database on my host server using the control panel. But how can I install my current database that contains hundreds of tables, views and stored procedures, thousands of records... Running a T-SQL script is a real pain. There is only one answer for all these requests: myLittleBackup. myLittleBackup helps you restoring a database backup on your host server in five clicks, without opening any support ticket. Over the last year using this product, I can safely say it has saved our staff and customers countless hours of back and forth when backing up and restoring Microsoft SQL Server databases. 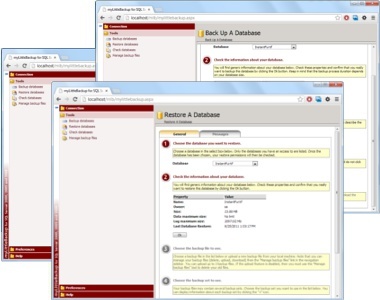 Prepare a backup of your database using your favorite tool. 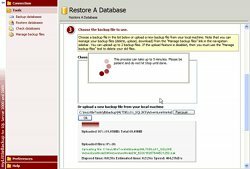 If you're switching to a new hosting company, then you must request this backup to your old hosting company. Next time you have to choose a hosting company, don't forget to check the offer includes myLittleBackup ! 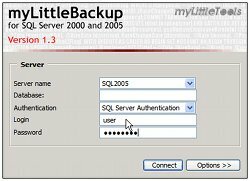 myLittleBackup is licensed per SQL Server instance. License includes email support and free minor upgrades.